The Bertinet Kitchen opened in September 2005 in the centre of beautiful and historic Bath. Owned and run by French baker and chef Richard Bertinet, the school offers a range of relaxed and fun courses for food lovers of all abilities and specialist baking and bread making courses for amateurs and professionals alike. The school won the South West Tourism Award for Best Tourism Experience in 2009 and has been featured in the US television series on PBS: Gourmet’s Adventures with Ruth – A Tour of Cookery Schools Around the World. Originally from Brittany in north-west France, Richard trained as a baker from the age of 14. 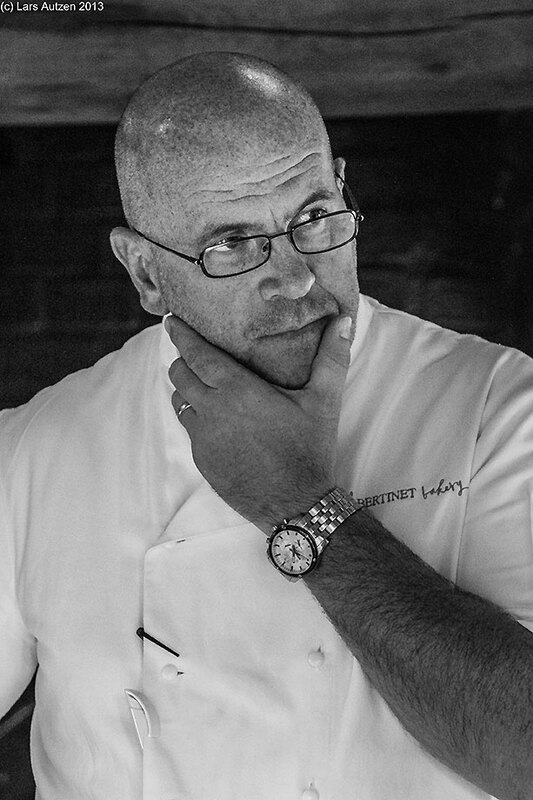 Having moved to the UK in the late 1980s, he started cooking and his catering background included stints at the Chewton Glen Hotel, as head chef at both the Rhinefield House Hotel in the New Forest and the Silver Plough at Pitton in Salisbury where in 1990 he was awarded the Egon Ronay, Pub of the Year and American Express Magazine, UK Pub of the Year. In 1996, a position as Operations Director with the Novelli Group of restaurants brought him to London where in 1998 he started advising small food related businesses. The business flourished causing Richard to set up the Dough Co, his consultancy business, in 2000 and to split his time between consultancy work advising on the development of new products for several supermarket chains, teaching and writing. In 2004, with a young family, Richard and his wife Jo decided that it was time to leave London and head West to be closer to Jo’s family. The plans for The Bertinet Kitchen began to take shape and they found the premises at 12 St Andrew’s Terrace, Bath at the tail end of that year. 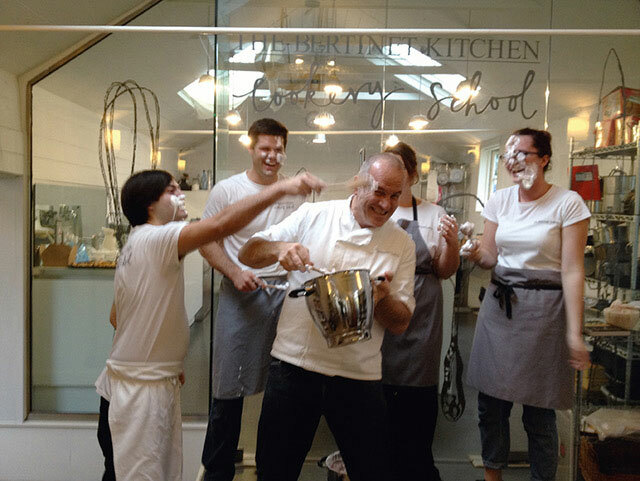 The cookery school opened in September 2005 in the same month that Richard’s first book Dough was published to critical aclaim and a host of awards (IACP cookery book of the year 2006, James Beard Award for Best Book (Baking & Deserts) and the Julia Child Award for Best First Book). Richard published his second book Crust in 2007 (World Gourmand Award for Best UK Book -Baking) and Cook – In A Class of Your Own in 2010. Two immensely popular books have followed: Pastry in 2012 and Patisserie Maison in 2014. Richard was named the BBC Food Champion of the Year 2010 at the BBC Food & Farming Awards on 24 November 2010. Richard makes regular TV appearances on programmes such as Saturday Kitchen and An Extra Slice. Jo is the boss! Formerly a commercial lawyer in London, Jo heads up the company and all things Bertinet. Carrie is the glue that holds the team together. Carrie has a background in TV production and not only is she in charge of money and media but she is also the lovely person who deals with the team. Kelly keeps us all in shape and the office running smoothly. Able to turn her hand to anything, don’t be surprised to find her questioning Richard about her fougasse! Jen is heading up our Kitchen team having recently moved to Bath. Bringing a wealth of experience and skill on the baking and cooking front, Jen has also taken on a building project to get her house in working order. Flour and dust are on the cards for a few months we think. A fantastic new addition to our team, Daisy brings a huge talent to the Kitchen. Her baking is something to behold, ask her about her pink unicorn cake! Jenny Chandler studied Spanish and Catalan at the universities of Bristol and Barcelona. After training at Leith’s School of Food and Wine in London, she worked as a chef on a luxury yacht based in the Mediterranean and in Barcelona. She is our longest-standing and most experienced house guest chef and has worked closely with Richard since the school opened in 2005. She runs her own classes in Bristol and has written two cookery books on Spanish Food: The Real Taste of Spain and The Food of Northern Spain (shortlisted for the prestigious Andre Simon award). Her book Pulse was published in 2013 and in 2016 the UN appointed her Ambassador for the Year of Pulses. Her latest book is Cool Kids Cook. Yolande is one of only 7 people in the UK to have acheived the prestigious Master of the Culinary Arts for Pastry (other holders include Claire Clark and Benoit Blin). Her career included numerous head pastry positions at renowned 5 star hotels in UK and Switzerland. For several years now she has been a University Lecturer and is currently at London South Bank University, teaching Patisserie and Chocolate – she is also an Ambassador for Cacao Barry. Yolande has been very active with WorldSkills for the past 15 years as a trainer and most recently as Competition Manager; she is just back from Abu Dhabi where she successfully coordinated 28 countries to compete and show off their Patisserie and Confectionery skills. Valentina is a much loved and noted authority on Italian Food and has written over 20 books on Italian cookery including the award winning Perfect Pasta. She appears regularly on television and has had her own series on BBC called Italian Regional Cookery. Monisha grew up in Mumbai with her grandmother, her mother and many aunts were all keen cooks. After leaving school she qualified as a chef before moving to England when she was 22. She tried out countless recipes in order to replicate what she had eaten in India while paring down the fuss and bother of traditional Indian cooking. She has worked as a food consultant to The Times of India group of newspapers where she cooked for national and international celebrities and more recently has written a number of books on Indian cooking. She teaches in London and with us in Bath. Ghalid was the founder chef of Ottolenghi the fantastic London bakery. He works as a chef and patissiere and teaches in London and with us at The Bertinet Kitchen in Bath.